Morrelli & Melvin have teamed up with Aeroyacht to introduce a new line of luxury super catamarans. The Aeroyacht 110 is the first of the Aeroyacht range to fly from the design to the production phase. A sign of the changing times, it sports an optional 2-seater Icon A5 amphibian sports plane and pod to house it. Referred to by many as today's most innovative American luxury yacht, the Aeroyacht 110 is a high-performance luxury catamaran. 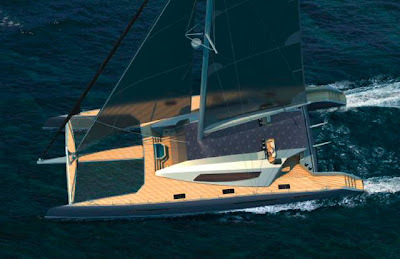 Gregor Tarjan, founder and president of Aeroyacht, collaborated with Morrelli & Melvin on the high-performance luxury catamaran to introduce the latest amenities, style, speed and stability to his visionary yacht. In addition to spacious and comfortable teak decks, a large galley and saloon, a 1,250 square foot social and entertainment platform, a low semi-fly and twin helm stations, this performance cruiser has three private, split-level suites. Not only is the Aeroyacht spacious, it is fast. Speeds of 35 knots can be attained in comfort. Speed, size and carefully calculated weight distribution deliver minimal sea-induced motion for the entire range of Aeroyachts -- the Aeroyacht 95, 110 and 125.